The lawmakers have implied that, in exchange for ponying up the money — which Cooper would control via an escrow account — the utilities would receive key water quality permits from the N.C. Department of Environmental Quality (DEQ). Rep. Becky Carney, a Democrat from Mecklenburg County, and Sen. Floyd McKissick, a Durham Democrat, voted no. “I don’t know how much money we’re spending,” Carney said. The $6 billion Atlantic Coast Pipeline would carry natural gas for 600 miles, beginning with a fracking operation in West Virginia, continuing through Virginia and into North Carolina. The ACP would enter the state in Northampton County and travel more than 160 miles to Robeson County. From there it would connect to a different pipeline and could transport natural gas into South Carolina and even abroad. (Duke Energy emphatically denies that any gas will be exported.) The project would cause enormous environmental damage — enough that DEQ assessed the utilities $11 million in mitigation fees — and would run through low-income areas and communities of color, including many Native American tribal lands. 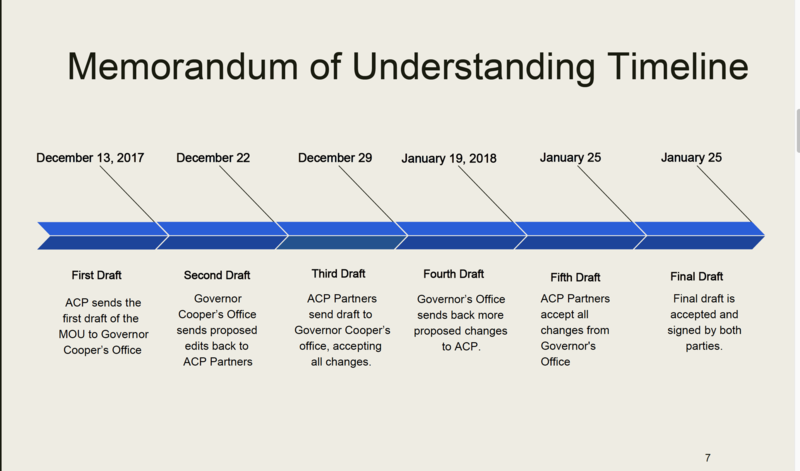 In January of this year, Cooper announced a non-binding $57.8 million Memorandum of Understanding that his office negotiated with the utilities, which had formed a separate entity, ACP, LLC. The MOU had gone through several drafts, beginning in December. It started as a $55 million Memorandum of Agreement, which would have been contractually binding, said Newton, and morphed into a Memorandum of Understanding that gave the governor control over the disbursement of the funds. Half of the money was to be paid up front, after federal regulators issued their final approval; the other half was due upon completion of the pipeline. The money would have gone into an escrow account for economic development and renewable energy projects. The day after Cooper announced the MOU, state environmental regulators issued a water quality permit, an essential — and final — major hurdle to the project’s approval. DEQ has repeatedly stated that the MOU and the permit were unrelated. The governor’s office did not have a representative at the meeting. From the account of Sadie Weiner, Gov. Cooper’s communications director, posted as the subcommittee meeting wound down. Virginia cut a similar deal with ACP, LLC, but it was between that state’s environmental regulators and the utilities and was contractually binding. The amount of money was nearly identical, but the Memorandum of Agreement — not merely an “understanding” — named specific projects and nonprofits that would receive the funds. Complicating matters is the presence of DEQ’s “draft denial” of the permit that circulated among agency staff in early January. Later that month, as the MOU entered its final drafts at the governor’s office, the draft denial had become an approval letter. 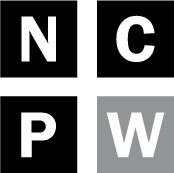 Although Newton said he had never seen such a procedure for major projects, in reviewing routine case files, Policy Watch has noticed that DEQ has occasionally written two versions of letters — one denying and one approving — for projects nearing the end of their review. The fact the governor would have control over the funds, not the legislature, particularly irked lawmakers who have been in a power play with the executive branch since the 2016 election. Appropriations are to be approved only by the legislature and go through the treasurer’s office. And in retaliation, the legislature passed a law earlier this year that nixed the MOU and redirected the money to school districts along the pipeline route. No money has been disbursed because the project hasn’t received final construction approval from federal regulators. In previous interviews, the utilities declined to say whether they would still honor the MOU under the legislature’s terms. Regardless of what investigators learn, the timing of all of these events is, at the very least, bad optics. It has incensed both Republican lawmakers, and, in a rare display of unity, many environmental groups, although for different reasons. “Did the governor hold the permit hostage for a slush fund under his control?” Brown asked. Therese Vick of the Blue Ridge Environmental Defense League, had a different theory. “The money was to sweeten the pot,” she said, to assuage the thousands of North Carolinians who had fought the project. The governor’s office has also failed to produce public documents requested multiple times by lawmakers. As part of its vote, the subcommittee is also filing an official Public Records request seeking correspondence, notes, emails and other documents related to the MOU. Vick and Policy Watch independently filed public records requests with Cooper’s representatives last February. The hundreds of pages that have been produced have little to do with the ACP. In fact, Policy Watch received dozens of repetitive emails outlining the office’s vacation policy. Newton, who before becoming a lawmaker was a long-time employee of Duke Energy, said the subcommittee has subpoena power and will use it, if necessary. It’s as yet unclear under what criteria the committee will hire the investigators and whether that process will be transparent. Marvin Winstead, whose 70-acre Nash County farm would be bisected by the Atlantic Coast Pipeline, has again stymied the utilities that want to seize part of his land under eminent domain. On Wednesday, U.S. District Court Judge Terence Boyle granted Winstead a 90-day stay, during which ACP, LLC can’t access his land for any reason, including to begin tree-cutting. 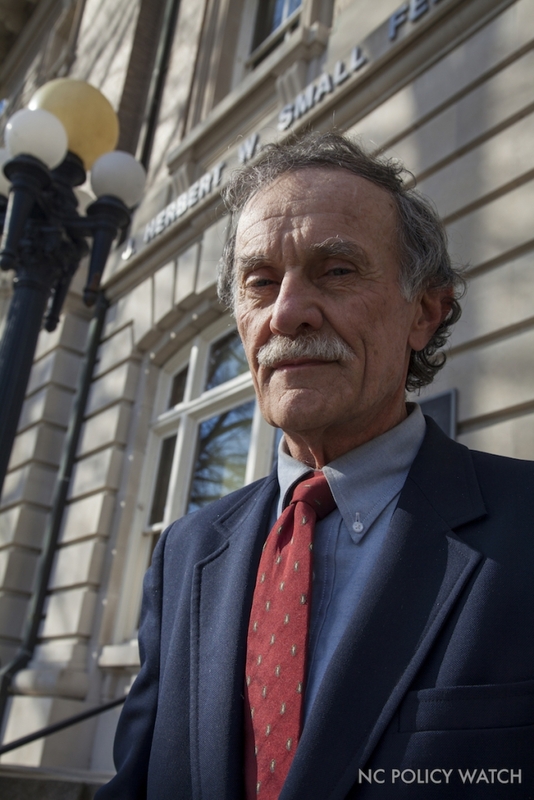 After 90 days, which would be Jan. 29, Boyle could decide whether to continue the stay. Winstead’s attorney, Cathy Cralle Jones, had petitioned the court for the hiatus because a three-judge panel from the Fourth Circuit Court of Appeals is deliberating a motion filed by several environmental groups that has effectively stopped all work on the Virginia segment. Environmental groups, like the Sierra Club, have challenged several aspects of that portion of the pipeline. Those legal maneuvers have resulted in a stop-work order and three stays over the past four months. Eminent domain is generally used by government to condemn land for roads and other public benefits. But in this case, private companies, while providing public benefits but also earning billions in revenue from them, are using those powers. In Winstead’s case, about 11.6 acres would be seized under eminent domain — about 16 percent of his farm. Not only would easements for the pipeline come within 275 feet from his house, they would cut diagonally across his farm, which grows row crops each year. The pipeline route would also take out a 100-year-old tree in the middle of the farm.